Adsterra Review- Should You Join It Or Not? There are multiple ad networks for bloggers and publishers available but whether all worth it? It is no longer a secret that many ad networks just come, do some business and leave one day without paying to their publishers. And so being a webmaster or publisher, you should be very careful before joining any ad network. The same applies to both advertisers and publishers. Recently I came across another ad network named Adsterra and found it very useful with varieties of ad options. In this Adsterra Review, I will share the details about the network from both advertisers and publishers perspective. Also, I will check whether you should join the network or not. So, let’s start with the Adsterra Review and see how it is useful for both advertisers and bloggers. Adsterra is a premium advertising network started in 2013 providing the better advertising solutions to all the parties. Since then they keep on growing and currently, Adsterra is able to deliver over 10 billion impressions per month. It is one of the fastest growing ad networks and has established themselves as a market leader in the many ad segments. It mainly offers performance-based solutions for advertisers and media partners worldwide. Currently, they have over 500 advertisers and a dedicated team of around 150 employees. The best thing with Adsterra is, they provide a technology-enabled platform so that the advertisers can get maximum what they deserve. Today Adsterra provide traffic from over 190 countries to their advertisers and ensures that their money is getting properly return. Adsterra has come a long way to achieve such stats which every advertising networks dream of. Let’s see the features of Adsterra network. Here are some of the amazing features of Adsterra ad network which helps both advertisers and publishers to achieve their goals. Personal Account Manager: You will get a dedicated account manager for your campaigns who will keep you updated with the latest buzz. They will also help you to optimize your campaigns. Security: Adsterra is a technology-enabled platform which uses third party fraud detection systems that automatically monitor the security of all ad campaigns. Conversion Tracking: Choose your profitable plan to target mobile and desktop traffic for high conversion through best fitting payment model: CPM, CPA, CPL, CPO, CPI (PPI). Real-Time Statistics: Get instant access to your detailed statistics and track your performance in real time. Companies like Jabong, Ali Express, Jumia etc. are advertising on Adsterra and so publishers can expect some great return. Adsterra allows you to monetize both desktop and mobile traffic. At the same time, advertisers can also target different devices as well as ad sizes. Below are some of the major ad formats provided by Adsterra to the advertisers and publishers. All the ad formats are available separately for both desktops as well as mobile traffic. Leader Board: This is usually of size 728*90 and publisher place this after the logo in the header part. Although not much clicks get here but good for branding purpose. 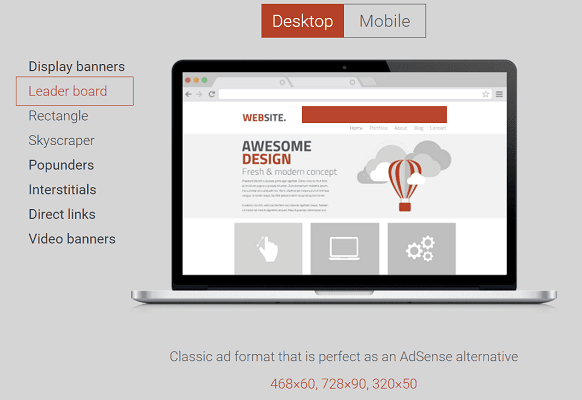 Rectangle: Classic ad format that is perfect as an AdSense alternative. Can be placed anywhere you have space on the web page. Pop-under: If you are having viral traffic, such ads can work best for you. Direct Links: No need to create banners or other promo materials. There is a link which is placed on any placement of publisher: banners, texts, videos etc. Note that it is a sub-type of POP-UNDER. Adsterra allows you to get connected with the best of traffic which converts. You will have the option to target only that traffic which you need. This can be based on multiple segments like device, location, activity and many others. Here are some of those. Also, there are multiple plans (CPM, CPA, CPL, CPO, CPI (PPI) available and so you can choose to advertise as per your need. Retargeting is a form of online advertisement that can help your audience on every stage of your Sales funnel. As we know only 2% of traffic get converted in the first attempt while 98% converts in the repetitive attempts and so retargeting is required. Adsterra offers to retarget in pop-under ads. Easy integration process and detailed tracking of all traffic sources through HasOffers, Volume, Tune, Cake, AppsFlyer and other partners. Apart from the normal optimization shared above, there are many more advanced optimizations available here. You can do micro-optimization based on the following. Adsterra provides excellent features for publishers as well. You can monetize all your traffic with Adsterra and can earn comparatively better revenue. The integration is very simple and you just have to follow the following three steps. Highest CPM Rates: Monetize your every impression with 100% fill rates and competitive CPMs with customized to your needs solution. Safe Ads: We offer maximum security and protection against common malware and bad ads through our in-house and third party fraud detection system. On-Time Payments: Adsterra deals in NET 15 payment basis and you won’t have to wait for the payment anytime. They are known for the timely payment. Referral: Being a publisher you can also earn by referring someone. You’ll get 5% of the revenue generated by the Publishers you referred to Adsterra Network for a LIFETIME. This is basically for the advertisers where they can get an estimate of the rate. You can check how much you will have to pay based on the geography of traffic you need. They have shown the details as per the geography and countries like US-UK comes in Tier I places. This was all about Adsterra Review. I hope you got enough understanding about the network from this Adsterra Review. 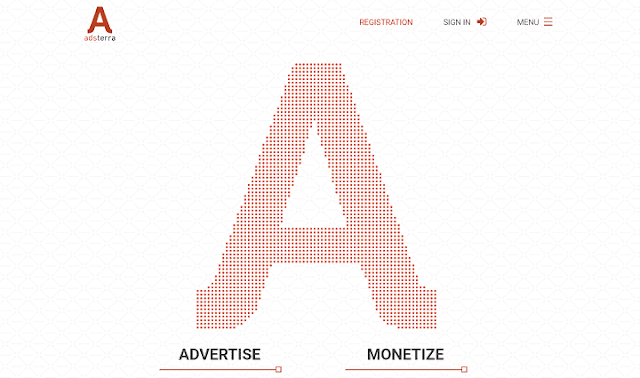 Adsterra is definitely one of the fastest growing advertising networks and if you are looking to monetize your website then it can be your ideal destination. The rates are comparatively better than the other advertising networks. Do try Adsterra and share your experience with us. You can sign up for Adsterra Advertiser account now.